Federal Power-Shok™ comes loaded with their Triple Plus® wad system. With a plastic buffer that keeps pellets shape allowing for better patterns at distance, the design allows for better shot alignment, round after round. These patterns allow for more accuracy and performance—whether it be on a hunt or in self-defense. 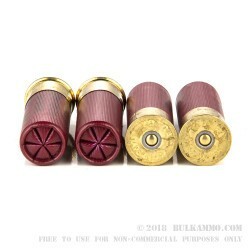 This Federal 12-gauge 00 buckshot comes loaded in a 2-3/4" shot shell, with nine pellets of 00 buckshot, and can produce a muzzle velocity of 1140 fps. 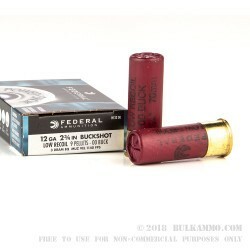 Considered the low-recoil variation of this shotshell, the round allows for less shooter fatigue and makes for more time having fun in the field or on the range without the shoulder bruises. 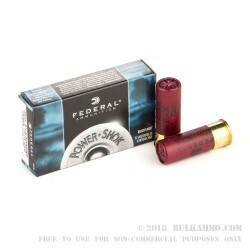 This federal 12-gauge package comes with 55 rounds per box. 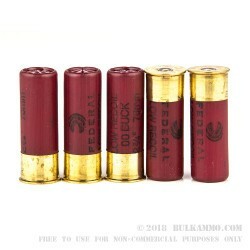 This American-made shotgun shell is produced in Anoka Minnesota by Federal Ammunition. For nearly 100 years, Federal has produced reliable ammunition for a wide variety of applications. Whether it be hunting or self-defense, Federal’s ammunition is known for its quality and has earned the trust of generations.